Haven’t decided on a hotel yet? You can look at other available hotels in the North Rhine-Westphalia region with Booking.com. Often overlooked by travelers who must imagine vast landscapes of belching industry, in reality the majority of North Rhine-Westphalia is covered in woodland and dotted by quiet lakes and unique, moated castles. 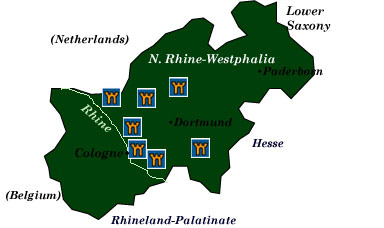 The rich natural resources of the Rhine-Ruhr region led the way for the German industrial revolution, creating, in turn, one of the most heavily populated areas in the world. However, cities are vibrant and can boast of first-class museums filled with medieval treasures, theaters, and orchestras. One of the best-kept secrets of the area is that nature parks are never far away, and small towns live life at a leisurely pace. Transportation is excellent, with trains and buses networking throughout the region. And you won’t see as many tourist buses thundering through town as you would in Rothenburg or Munich. Cologne (Köln) Located right on the Rhine River, for 2,000 years Cologne has been a crossroads of trade and one of the most important cities of northern Europe, culturally and economically. Founded by the Romans during the reign of Julius Caesar, the city transformed into a bishopric under Charlemagne several hundred years later. Despite massive Allied bombing during World War II, the rebuilt city offers many marvels to see. The Dom, or cathedral, is truly one of the most majestic Gothic structures in the world. Now a UNESCO World Heritage Site, building began in 1248 to house relics of the three Magi, but was stalled off and on until 1823 when it was finally completed. Don’t miss the photos taken shortly after the end of the war in 1945 that show an untouched, glorious cathedral rising from the utter devastation surrounding it. Cologne is also known for its Museum Ludwig, which houses some 774 works of Picasso, as well as an excellent collection of Dali, Warhol, and Lichtenstein. For art dating from 1300-1900, try the Wallraf-Richartz Museum. A fine collection of Roman artifacts found in the Rhine region are displayed at the Römisch-Germanisches Museum, and for the sweet tooth in all of us, the Schokoladen Museum (Chocolate Museum) can even teach Willy Wonka a thing or two. Aachen (Aix-la-Chapelle) is forever associated in history as the city of Charlemagne, who picked it as the center of the Holy Roman Empire. Dominating the town is the stunning Dom, or cathedral, which houses Charlemagne’s marble throne and relics of the emperor himself. It is also a UNESCO World Heritage Site. Thirty-two German emperors were crowned here. Aachen’s 14th-century Rathaus is worthy of a visit, too. It was built on the original site of Charlemagne’s palace, part of which still survives, and is adorned by statues of fifty of Germany’s rulers. Münsterland’s Castles Literally hundreds of moated castles dating from the 9th and 10th centuries once existed in about a 100 km radius from the town of Münster. Today, about 100 are still standing and are in use—some as hotels, some as private residences. Descendants of the original knights and barons still live in forty of them. Münsterland castles are noteworthy for their dependence on a moat for defense, since the surrounding countryside is flat with an abundance of streams. The “100 Schlosser Strasse” is a bicycle route that passes by—you guessed it—100 castles. Take note that many of the castles are private property and can only be viewed from the outside. Two exceptional castles that may be visited are Burg Vischering and Schloss Nordkirchen. Sauerland can boast of five nature parks, which are located in the southeast portion of North Rhine-Westphalia. Lovers of the outdoors will appreciate the plethora of activities the area offers: cross-country skiing, bobsledding, bicycle and hiking trails, fishing, sailing, swimming, and kayaking. Towns in the area are small and quaint, with medieval castles dotting the hillsides.